Immediately after the Brest-Litovsk Treaty, the Czechoslovak Legion decided that the struggle for independence against the Austro-Hungarian Empire must continue and were set to go to France, half a world away. They avoided enemy capture and headed for the east of Russia, believing that they will have a clear path. They were wrong. The Czechoslovak Legion was originally formed by active Czech nationalists inside Russia who wanted independence from the Austro-Hungarian Empire. For this reason, they joined Russia in the struggle against the Central Powers. However, Russia signed the Treaty of Brest-Litovsk on March 3, 1918 effectively ending its participation in the First World War. The Czechoslovaks decided that they would continue the fight, even without the help of the Russians, and wanted to leave the Eastern Front- at that moment, the Czechoslovak Legion numbered 40.000 soldiers. Their passage was negotiated with the Russians, who allowed them to pass as free citizens, “with a certain number of weapons for self-defence”. If the understanding between the Czechoslovaks and the Russians would have been respected, things would have been different in terms of the civil war that had begun to engulf Russia. The legion was regarded with mistrust, creating ever greater tensions. The trains were stopped by local soviets, who swamped the Czechs with their propaganda and tried to confiscate their weapons. On May 14, the Russians crossed the line and they would come to regret it: they arrested a few of the Czechs and Trotsky’s exaggerated reaction of May 25 to this action in Chelyabinsk would trigger the revolt of the Czechoslovak Legion. From that moment on, they took over the Trans-Siberian railway and occupied numerous cities: Novonikolayevsk in May 26, Penza and Sirzan on May 28 and May 29, Tomsk on May 30, Omsk on June 6 and Vladivostok on June 29. 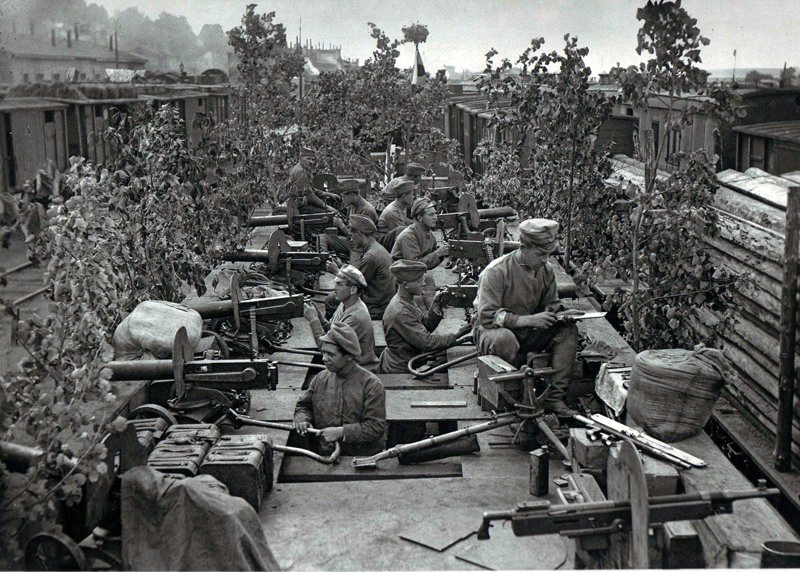 The Red Army was not properly organized, and the Red Guards- poorly prepared and undisciplined, made up of local workers, who often fled at the first sign of danger- did not pose any problems to the well-trained Czech troops. The Czech leader, Tomas Masaryk, had this to say about the situation in Siberia: “I’m telling you, our men are good soldiers when they are in the thick of battle; there, they are brave and smart like few others. They can get out of any mess; but when they are not in trouble, they go searching for it. They don’t always persevere and they fail spectacularly when they have nothing to do; it was so before they went to Siberia and at the end of the Siberian campaign. However, no other better armed and organized armies would have done better in the Siberian campaign. I was only interested in them being able to fight when they reached France; their fraternities and special regulations inherent to an army of volunteers, that didn’t matter, only to be combat ready. We organized courses for officers, training schools for soldiers, and all sorts of workshops, tailors, shoemakers, butcher’s shops, print shops, a theatre, a post and a bank for our soldiers to keep busy and not scatter. They had to find their own provisions, and that was hard; the Ukrainian cads did not want to sell their roubles, they preferred to sell them to the Germans for nails. Paper money was of no value to them, a primitive commodity-based commerce sprang up. In this regard, it was better in Siberia. Of course, when our boys entered the battle, it was a delightful sight- but it was a fight for life and death. The soldiers were fond of me and considered me their supreme commander; especially because I never cursed at them- in the army, it goes without saying that people have to be honest with one another- and perhaps because I was not afraid”.